Test your gutters for leaks, and make sure they’re working properly to ensure you keep your home safe. Water is dangerous because it’s sneaky. 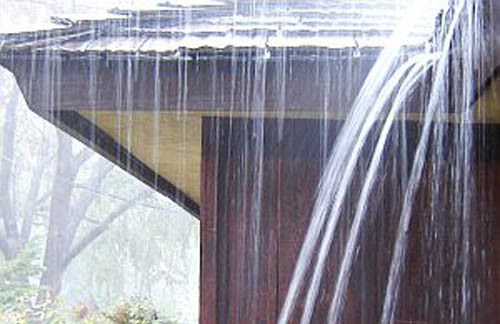 Gutters direct water away from the foundation of the home, because that’s where water does the most damage. Water will erode dirt, create mold and chip away at the structural integrity of the building, potentially causing major problems. Learn the proper way to discover it before it damages your home. Gutters generally get clogged by leaves and other foreign matter. Preserve gutters and avoid leaks by cleaning them regularly. Two times a year, in fall and spring, is a great time to clean gutters. When gutters are unencumbered by debris, test them for leaks in order to make any needed repairs. Step 1: Find your position. Set up a ladder where you can climb it very easily or decide on a place around the house that provides you access to the top of the gutters. Step 2: Run the hose. Take the garden hose, turn it on, and take it to your position. Place the hose inside the gutter so the water will run into it. Either set the hose up so it will not move or get a helper to hold the hose in position for you. Step 3: Walk around the perimeter. Check the entire perimeter of the house and look for water draining down from the gutters anywhere it shouldn’t. Periodically move the hose into new positions around the house in order to test the entire gutter system for leaks. Use a flashlight in dark areas, and be thorough. Step 4: Take note of problem areas. Pay attention to any problem areas you find during your leak check. 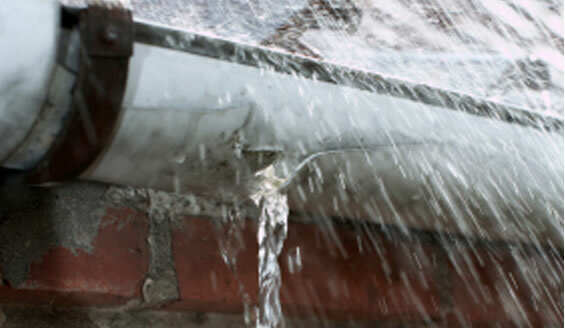 Any areas where water is appearing and shouldn’t must be repaired in order to keep the gutter system healthy. If your gutters are leaking, it’s not the end of the world. Most leaks can be patched easily. If the damaged area is beyond repair, a piece of the gutter system can be replaced. Gutters may develop leaks for any number of reasons. Everything from simple rust to serious storm damage can cause holes that prevent your gutters from functioning properly. Patch small holes with roofing cement or a metal repair patch kit. Aluminum flashing can be used to repair holes in aluminum gutters. When patching holes does not work, cut out the section of gutter that’s damaged and insert a new piece. Gutter repair kits can be purchased in home improvement stores. Keep your gutter system functioning with regular maintenance. Check for leaks and repair them as you find them. Leaky gutters will allow water to get to places that need to be protected from erosion. A healthy gutter system is essential to maintaining proper drainage around the home, so take the time to look for leaks. The quicker you find and fix the problems, the smaller those problems will stay. When left untended, small problems become really big issues.